My diet has changed drastically from when I worked as a manager at Burger King in college. The changes came in a series of shifts that my wife and I made in response to health issues her or I have faced over the past decade and a half. The most recent shift happened about two weeks ago. In an attempt to lower my blood pressure without medication I have been cutting out more sugary foods and adding more spinach, celery, and kale. I have even choked down a couple bottles of beet juice. What we eat matters and it matters a lot. It matters for our health. From a Christian perspective, it matters to God. Our bodies are a temple of the Holy Spirit. How we treat our bodies isn’t just a question of health or disease, but a question of obedience or sin. We obey Jesus when we eat food that nourishes our bodies and prepares us for embodied works of service. If we relegate obedience to the spiritual/cognitive realm, we fall into the platonic error of imagining that the body is unimportant. Our bodies matter to God. Therefore, what we put into our bodies matters to God. False worship means worshipping the created thing instead of the Creator, worshipping the gift instead of the giver. For a health-conscious culture, and for health-conscious Christians, this is a real danger. “Worship” is a funny word that we often associate with specifically spiritual practices like singing and prayer, but here I mean something more expansive. We “worship” food when we mentally grant it divine attributes, when we come to believe that it can save us. For some, food is the answer to all our problems: We seek the right diet to improve our health, our mood, and our body image. There’s an important aspect of truth here. Better food can make your life measurably better (and bad food can make your life measurably worse). But food has its limitations. It won’t fix your relationships. It won’t give you peace with God. It can’t protect you from tragedy. Even for what it sets out to do – to make our bodies healthy – it is only one aspect of a whole matrix of complex factors: genetics, germs, environment, community, exercise, etc. If you put your hope in food, it’s eventually going to let you down. You might make aging a little less painful, but you cannot stop the inevitable. I don’t think that we’re left between the false dichotomy of saying either that “food is the most important thing” or “food doesn’t matter.” No, we need to simply view food for what it is: A good gift from a good Giver. That enables us to receive it with thanksgiving. God is good and he has given us the blessing of good food. That food, and the bodily benefits it confers, do not point to themselves, they point us back to our Creator. This perspective on food calibrates our expectations about what food can and cannot do. Jesus said some shocking things while he was on earth, and perhaps one of his most shocking statements centers around food. Perhaps unsurprisingly, the story concludes with this statement: “From this time many of his disciples turned back and no longer followed him” (John 6:66). My Catholic brothers and sisters say that Jesus is talking about the Eucharist and that eating the bread of the Eucharist really is eating Jesus’s flesh in obedience to his words in John 6. Personally, I think that Jesus pointed us away from this interpretation when he states: “The Spirit gives life; the flesh counts for nothing. The words I have spoken to you—they are full of the Spirit and life.” (John 6:63). What, then, is the logic of Jesus’s words? Simply this: We need Jesus. Specifically, we need his life and the eternal nourishment that he offers. The manna God gave Israel from heaven was a good gift and it sustained them in the wilderness, but it could not save them from death. It did, however, point them to the One who could. Jesus is the bread of heaven. He is the food that saves. How do we “consume” this food? “Then Jesus declared, ‘I am the bread of life. Whoever comes to me will never go hungry, and whoever believes in me will never be thirsty’” (John 6:35). This entry was posted in Christianity, Uncategorized and tagged Christianity, food, health, health food, Idolatry, Jesus, John 6, Salvation on March 23, 2019 by stevenkopp. If comfort is your god, you will never do what the LORD calls you to do when it threatens your comfort. If happiness is your god, you will never do what the LORD calls you do do when it threatens your happiness. If the approval of others is your god, you will never do what the LORD calls you to do when His approval is all you can expect to receive. God will not only ask you to do things which promote your comfort, happiness, and approval of others. He will ask you to do hard things that threaten them. Those who follow the pattern of Jeremiah follow the LORD simply because the LORD is their God, and they are not free to disown Him. This entry was posted in Christianity, Uncategorized and tagged approval, comfort, false gods, Happiness, Idolatry, Jeremiah on December 1, 2018 by stevenkopp. Timothy Keller’s book Counterfeit Gods covers a variety of potential “idols” – created things which we may be tempted to lift up to the place of “god” in our lives – money, romantic love, success, etc. The one that I most resonated with (read: am frequently tempted by) is political idolatry. This is a description of an extreme condition, but there are many smaller steps which take you there. Keller offers two signs of political idolatry. I think this explains many of the extreme responses we see during each political cycle. The side perceived as losing threatens to leave the country and becomes agitated and fearful, even violent. If their “side” or their candidate is out of power “they experience a death.” The focus all their attention on where they disagree with their opponents, instead of finding some common ground. The result is a poisonous political environment. “Another sign of idolatry in our politics is that opponents are not considered to be simply mistaken, but to be evil” (99). The Bible views sin as the primary problem in the world. Political idolatry, on the other hand, turns a political ideology into the main problem. Instead of seeing God as the ultimate solution, it sees something else (a rival ideology, a political victory, a politician, etc.) as the ultimate solution. When this happens our opponents don’t just disagree with us, but represent the embodiment of evil. At this point I want to push back on Keller a little bit. There are a few instances, I think, where a political ideology can be so opposed to God that there is simply no word other than “evil” to describe it. Nazis in Germany were not just following a “mistaken” ideology, but an evil one. It’s standard these days, though, to justify extreme reaction to some political ideology or candidate by comparing them to fascism or Hitler. But this is rarely justified and just might indicate that some form of idolatry is at play. The result of political idolatry being widespread in a culture (which I think it is), is “constant political cycles of overblown hopes and disillusionment” (101) and “increasingly poisonous political discourse” (101). Sound familiar? Natural affections are not a problem in themselves and engaging in politics can be a way of showing love of neighbor or standing up for justice for those who are being denied it. The problem comes when those natural affections are given too much weight. On a personal note, the election cycle has actually been redemptive for me. It has revealed pockets of idolatry in my own heart. But that revelation, while it hurt at the time, has enabled me to trust more securely in Christ. This entry was posted in Doctrine and tagged Anger, Christianity, counterfeit gods, Fear, Idolatry, political idolatry, Politics, Tim Keller on April 23, 2016 by stevenkopp. “Lots of good sermon material in there,” said Corky as he handed me a copy of gods at war by Kyle Idleman. 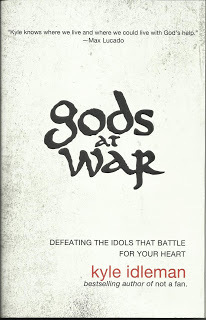 Indeed, Gods at War: Defeating the Idols that Battle for Your Heart , written by a teaching pastor, reads like a sermon series, and a quality one at that. Idleman opens up the book by explaining that idolatry, far from being an obsolete sin, is really the root cause of many surface sins. It’s a root cause because idolatry is all about misplaced worship and disordered loves. In combating idolatry, the battle for our heart is won or lost. After a few introductory chapters Idleman looks at a series of “gods” which battle for our hearts – modern day examples of idolatry. In three sections (the temple of pleasure, the temple of power, and the temple of love) he works through issues such as “the god of food”, “the god of money”, and “the god of family.” He concludes with the chapter “the god of me” where he contends that at the root of all of the other idols is the desire for us to be our own gods. Each chapter concludes with a series of “diagnostic questions” to help the reader determine where they might be susceptible to false worship. For instance, concluding the chapter “the god of success” Idleman asks “What’s your operating definition for success? What goals… chart your course?” In light of the chapter, these are probing questions. They also make the book ideal for group study. Idolatry is a big issue in the bible and it can be difficult to know how to apply commands against idolatry to modern day life. Idleman does a good job of bringing out some key applications. After reading the book in its entirety I would like to read a more scholarly approach to the same topic. How legitimate is the connection between commands against Old Testament idolatry and modern day vices? I still feel like there are some unanswered questions at this level. However, I was unable to find fault with Idleman’s applications. On the whole, his book answered more questions than it raised. I intend to use this book for group study with our church’s youth group. It is written for adults but the ideas are relatively basic and fundamental. The ideas of the book get to the heart, rather, to our hearts. There is a battle raging for our hearts. It might be easier, sometimes, to deal with surface issues, but it is necessary to allow God to search our hearts and to cleanse us from within. 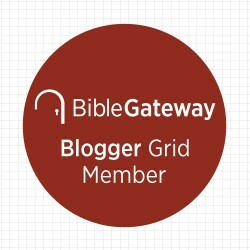 This entry was posted in Book Review and tagged Book Review, books, Christianity, gods at war, Idolatry, kyle idleman, Worship on September 2, 2013 by stevenkopp. This is what idolatry often looks like. We don’t get the top-button right (worshipping God) and so the rest of our loves, which might be legitimate in and of themselves, are out of place. Get that first button right – reserve worship for God alone – and all of our other loves line up. This entry was posted in Doctrine and tagged Christianity, Idolatry, kyle idleman, Worship on August 30, 2013 by stevenkopp. While on our recent trip to South Carolina we stopped in Kentucky to visit some friends. At a restaurant on the river we met up with Corky, the pastor who performed our wedding. Corky is on the pastoral staff of Southeast Christian Church in Louisville and was gracious enough to give me a copy of Gods at War: Defeating the Idols that Battle for Your Heart by Kyle Idleman, who is the teaching pastor of Southeast. The book is all about idolatry and its modern manifestations. I’ve listened to several messages on idolatry, all good, but it’s always been a bit unclear to me what makes something in your life an idol, that is, something that misdirects my worship away from the Creator onto the created thing. gods at war provides some nice perspective and clarity on this and other points. “When we feel overwhelmed by disappointment, it’s a good sign that something has become far more important to us than it should be. Disproportionate disappointment reveals…” displaced longing. 2) What do you complain about? Similar to above but this one is more about expression. That means this might be a good question to ask someone else for input on. 3) Where do you make financial sacrifices? 5) Where is your sanctuary? That is, where do you go when you’re hurting? 7) What are your dreams? What do you think of his list? What other “diagnostic questions” might you add? This entry was posted in Doctrine and tagged Book, Christians, false worship, gods at war, Idolatry, kyle idleman, Spiritual Formation on August 24, 2013 by stevenkopp. Worship challenges self-worship. We are called to bow down to God as the ultimate good. In worship we see ourselves in relation to God – as created is to Creator, a necessarily humbling experience. Worship also challenges materialism as the people of God gather together in the presence the God through the Spirit of God. As I mentioned in the introduction, worship, and here I mean what happens on a weekly basis in local churches around the world, challenges modernity on two fronts: self-worship and materialism. I will expand on each individually. Paul is likely describing the pagan idolatry prevalent at the time (… “and they exchanged the glory of God for images made to look like…”). Modern secularists no longer bow down to pieces of wood or stone but, make no mistake, we all worship something and it’s either the Creator or the created thing and, more than ever, our idolatry has turned to self-idolatry, to self-worship. Our first task, however, is not to fight the idolatry “out there” but to ask ourselves, “who/what are we really worshipping?” For, in the end, we will see that our own actions and values demonstrate that we often fail in this regard. Praise be to God, the indictment of Romans 1 draws us to the grace freely given in Jesus, which allows us, weak as we are, to truly worship God in spirit and in truth. The practice of regular worship (gathering together in a local body, singing songs of praise, hearing the Word), ought to do two things for us. First, it reveals to us the glory and goodness of God. Second, seeing the glory of God reveals our own finitude, weakness, and sin. This is necessarily a humbling experience, tearing down any notions we might have of self-worship. This entry was posted in Doctrine and tagged Idolatry, Spiritual Formation on February 2, 2013 by stevenkopp.